We are already consuming television content - not to mention movies, photos, music, games - on our phones, tablets and computer screens. It's about time that the largest screen in the house - the television screen - caught up, said Apple as they announced the launch of Apple TV (Gen 4). 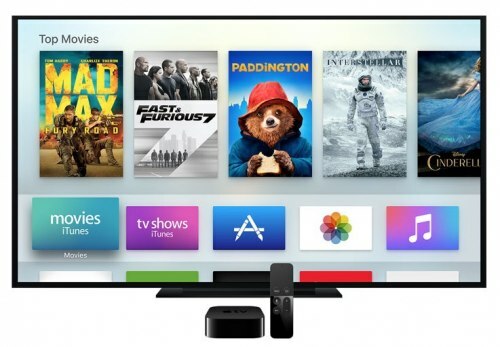 So arriving in Australia in time for Christmas, Apple TV is now available from $269. It may surprise you to know that this iteration is actually Gen 4 of Apple TV, but dont worry if you missed 1-3 as this version is going to be the one that you will feel super comfortable with - especially if you are the owner or an iPhone, iPad or iMac. Reviewers universally agree that this latest Apple TV offers a vastly superior user experience over previous models. Although your TV screen is across the other side of the room, Apple aims for the same personal and customised experience that owners of iPhones and iPads will be familiar with, by bringing touch and voice to the controls. The design is clean and modern, so that "the content is the hero" according to Apple. The screen feels alive and responsive as the use of parallax makes posters move as you scan over them. Its quick to bounce between apps without having to go back to the home screen - even if that home screen has been customised with all your favourites including your own photos and music as well as movies and tv shows. 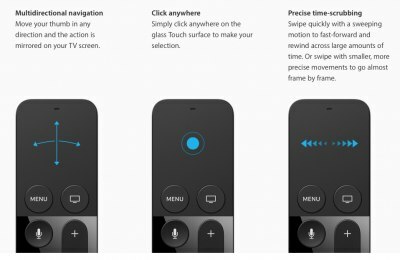 The Siri remote has a precise Touch surface as the top third of the device. The idea is you can use your thumb to swipe, scroll and move around the screen. No more fast-forward or rewinding either as you can swipe across the timeline and use preview frames to select exactly where you want to go. A couple more things about the remote - it's bluetooth so no more having to point it at the set-top box; it has a built-in battery which will only need to be recharged once every 3 months and this can be done with a lightening cable; and no more juggling remotes as it also controls the TV including volume. And how many times have you wanted to know an actor's name, or mis-heard a line? During the show ask Siri, "who is the actor playing the lead role?" or "what did she just say?" and Siri will pause the show and provide the answer. At the end of the day no matter how great the remote is, or the graphics, or the user experience, the decision to purchase Apple TV ultimately comes down to the content!